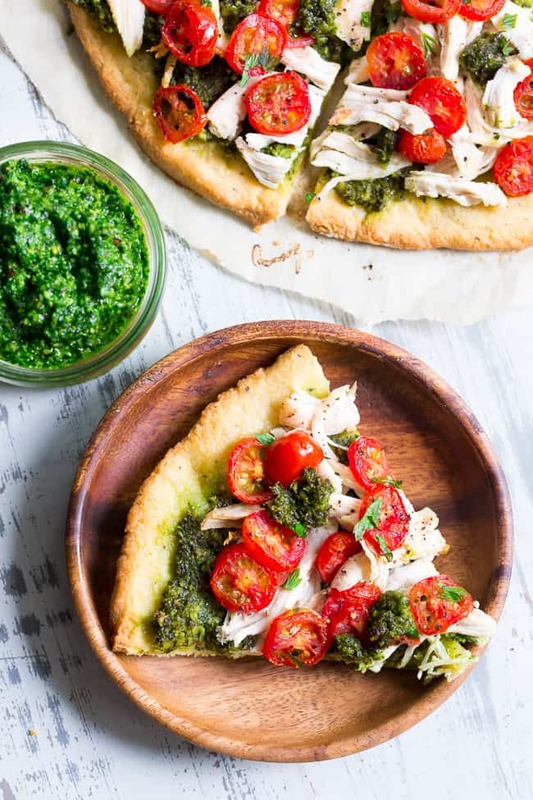 This simple chicken pesto pizza starts with the perfect quick and easy paleo pizza crust, topped with a flavor-packed dairy-free homemade pesto, shredded chicken and cherry tomatoes. 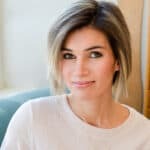 This fun meal great for dinner or lunch, is kid approved, grain-free, dairy-free and insanely delicious. 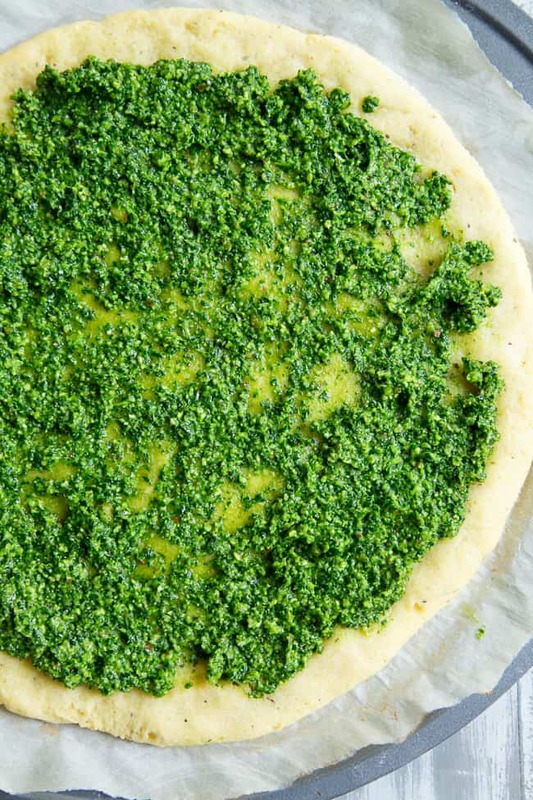 Did you know I tried to make a pesto pizza about a year ago and it was a total flop? I’m not sure what I was thinking when I put probably an entire cup of pesto on the crust and the whole things just got soggy and oily and really just horrible. 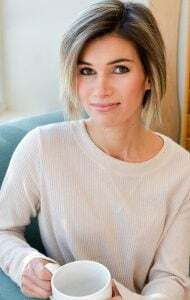 Perhaps I was just thinking that I love pesto (SO TRUE!) and, hey, the more the merrier! 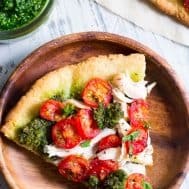 As it turns out, less is more when it comes to pesto on our paleo pizza, and, let’s just say I’m glad I came to my senses and gave this recipe another shot. 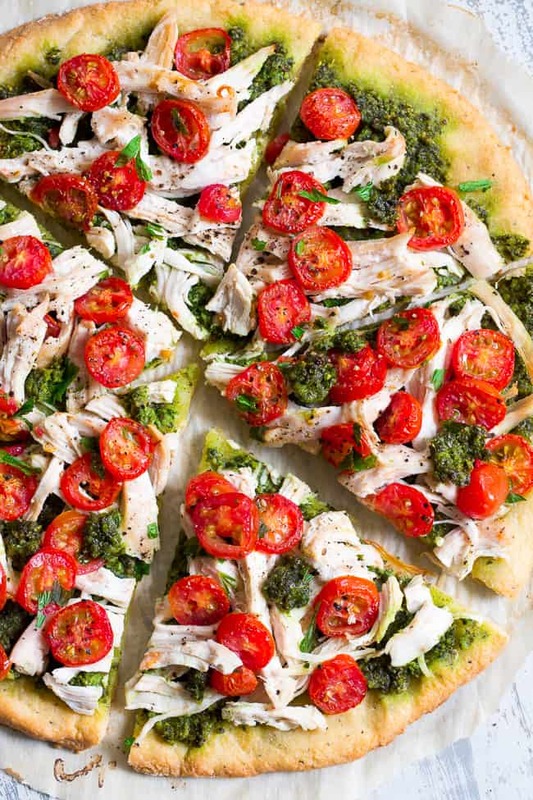 This one, now, is pesto pizza perfection. No dairy, no grains, no difficult-to-work-with-crust, no worries! Speaking of that crust – it’s become quite the popular recipe since I posted it over a year ago, and it still performs perfectly every single time. It’s the type of recipe that even a kid can follow and it’s made all in one bowl – which is always a plus by me. In fact, I don’t have nearly enough one-bowl recipes now that I’m thinking of it! 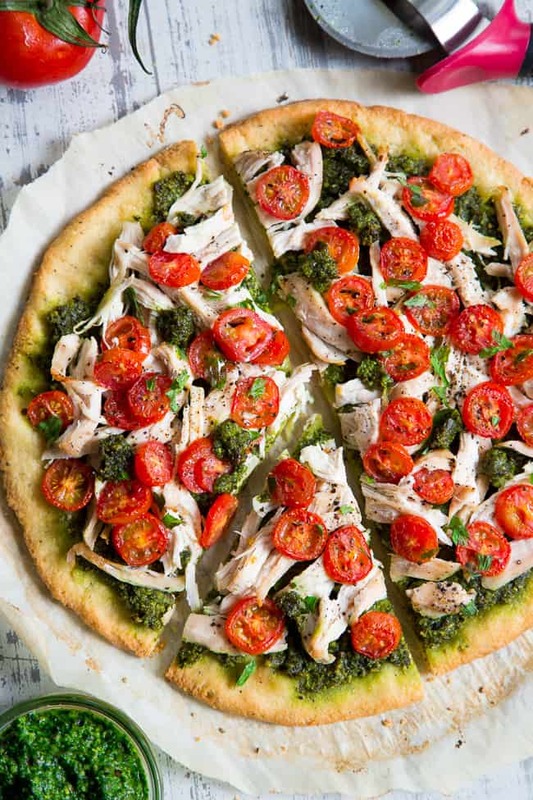 Pesto pizza glory! So first, before we make that crust, we need to make the pesto, of course! This particular pesto is similar to my others except that I decided to use pine nuts instead of walnuts. Realistically, you can use any nut in place of the pine nuts and it will turn out just fine. I happen to currently be in a little pine nut honeymoon phase or something (have you seen my kale Caesar salad?) and I just had to use them for this recipe. I recommend making the pesto in a food processor if you have one, although a blender should work as well. It blends up in about a minute, and you’ll be left with a whole lot of delicious pesto – more than you need! 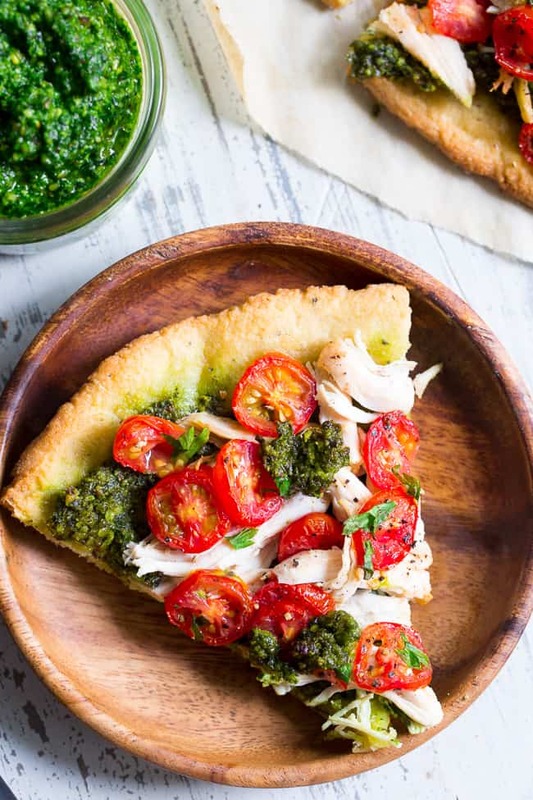 Of course, don’t be silly like I was and try to put extra pesto on the pizza – especially after I just told you how I ruined my last pesto pizza with pesto overload. 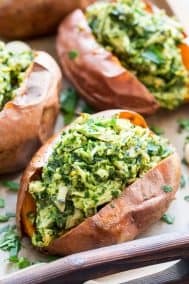 Anyhow, you can save the pesto in the fridge for about a week and use it as a dip, spread, sauce, or in recipes like my chicken pesto stuffed sweet potatoes and chicken pesto spaghetti squash. 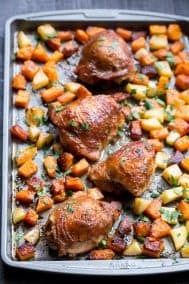 Then we have the chicken – you can easily use leftover chicken for this, this you don’t need a ton, or rotisserie chicken purchased from the grocery store. Lastly we have sliced cherry tomatoes and some fresh herbs to top it all off. You can use extra basil, parsley, or even oregano – whatever you like! And with that, I think we’re finally really to make this new favorite – are you ready?! Let’s go! 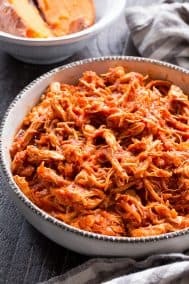 Sprinkle the shredded chicken over the pesto, then the tomatoes. 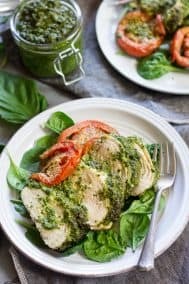 Dollop the remaining 2 Tbsp pesto in small amounts over the chicken and tomatoes. Sprinkle fresh herbs over the top if desired. 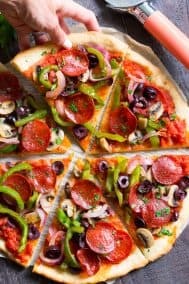 Bake pizza in the preheated oven or 15 more minutes, until edges of crust are a crisp golden brown and toppings are heated through. Serve immediately and enjoy! Store leftovers covered in the refrigerator for up to 3 days. 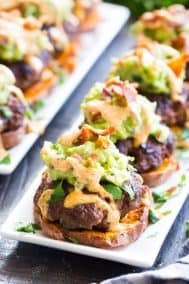 Want More Paleo Pizza-Themed Recipes? Try One Of These! Is the basil and kale/spinach tightly packed? Chopped? Thanks! 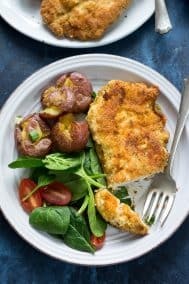 Is the nutritional yeast supposed to be TBSP or teas? The lower case has me second guessing myself. 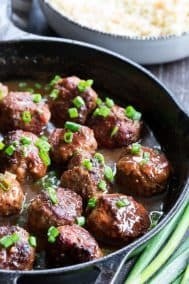 Being someone who just found out a couple of months ago that I have several food allergies, including yeast, I needed to find a yeast-free Paleo recipe. This pizza crust came out amazing! So delicious and crunchy!! No need for me to buy pre-made paleo or gf crust at the store. 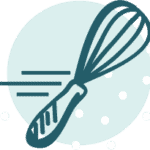 It obviously isn’t as convenient because it is made from scratch, but OMG it is so worth it! Thank you, Michele for this amazing recipe!! For some reason the nutritional info is not visible on this recipe. Any way to get that? Thank you! I made this tonight and it is delicious! This will be my new go-to pesto recipe, the nutritional yeast and almonds are genius. I made the pizza on a plantain crust. Instead of putting the kale in the pesto, I layered sliced kale leaves over the pesto and under the rest of the topping. I will be making this pizza repeatedly, thanks for sharing it!